Our Twitter Chat for James Paul Gee's What Video Games Have to Teach Us About Learning and Literacy will take place on Thursday, August 2nd at 8pm EST. Jennifer and I decided to up and ante by crowdsourcing the discussion questions. GOOGLE DOC CHALLENGE: "Take Down the Leader"
Directions: Think of a question we could discuss at our upcoming #levelupbc Twitter Chat for James Paul Gee's book, then complete the form below with the question you'd like us to consider. You may submit as many questions as you'd like. Please complete a new form for each question. Reward: We will select 4-5 questions for our discussion. We will award +10 levels up for each question accepted, regardless of the author. But look out! Jennifer and I are competing in this one, too... and we each want that top leader spot back! Deadline: All questions must be submitted no later than 11:59pm Wednesday, August 1st. Now that most of us have our copies of James Paul Gee's What Video Games Have to Teach Us About Learning and Literacy, why don't we open things up for discussion. Mr. James Paul Gee himself. Reward: It's the middle of the summer and Jennifer and I find ourselves away from our computers during the same week (Eeek!). Thankfully, two Level Up members jumped on board to help us out in the 11th hour. So we hope you don't mind that we're front-loading our prize for this week's challenge. Katy Vance (@katyvance) and Aimee Bartis (@aimeegbartis) have stepped up to keep score on our leaderboard, so we're thanking them with +20 levels up each for taking initiative (and being the first to respond). Deadline: 11:59pm Friday, July 20th. Find your highlighted, penned, and dog-eared quotes and share away! Wow! Your avatars are great! We can't wait to hear how you use them in your classes and libraries (there's already been a bit of buzz on the #levelupbc Twitter feed and blog comments). Last week we challenged you to name some websites for creating avatars and to share a couple of your own. You responded with veracity and enthusiasm, and we applaud you for it! But there can be only one highlander... I mean, winner of this week's avatar challenge. 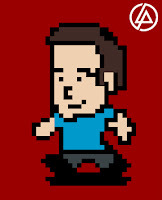 Anyone who shared an avatar website link or posted an avatar of their own earned a level up on our leader board (plus bonus levels for each additional link or avatar posted). 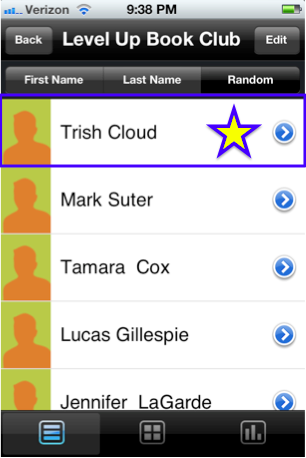 Each participant name was put into my hand PikMe app and this week's winner is none other than Trish Cloud! Way to go, Trish! You win a t-shirt with a print of your avatar! You'll be contacted directly with the details. Stay tuned for next week's challenge! Last week's crowdsourced gamification resource challenge pushed Level Up members to share those great game-based learning and gamification resources that we will all want to reference later. It also produced a Diigo group (Thanks, Katy Vance!) and a LiveBinder (Thanks, Jennifer LaGarde!). Our guild's curating strengths can rival that of any on WoW! 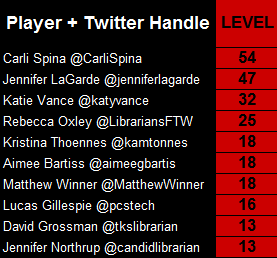 The #levelupbc reader with the most contributions was none other than Carli Spina! Carli's prize was a video thank you for all her hard work. I decided to go the gamer-route and customize a popular video game theme song to pay tribute to our dear pal, Carli. No apologies here. The things we do for love of Level Up. Enjoy! Way to go Level Up! As we start reading James Paul Gee's What Video Games Have to Teach Us About Literacy and Learning, we'd like to challenge Level Up members to think of themselves outside of their typical role as an educator or professional. Specifically, how do you see yourself in a game? Does your avatar resemble you or does your avatar take on characteristics you may not otherwise adapt in "real life"? What does it say about your personality and how you approach challenges? As a guild, we've already taken on a number of epic challenges consider how gamification will look in our own workplaces, classrooms, and libraries. Now it's time to see the avatar behind the gamification magic! Directions: Create an avatar of yourself and share a screen capture through Twitter (#levelupbc) or Tumblr. 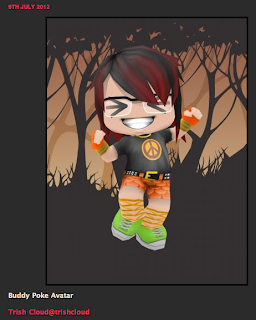 Use any of the following sites to create an avatar, or share a site of your own. Bonus points included! There are tons and tons of other avatar creation sites. Share your favorite in the comments below or via Twitter or Tumblr and we'll award bonus level ups! Reward: This week's reward may be out epic-est ever! Create and share your avatar and, if selected in our random drawing, we'll print it to a t-shirt for you to rock around town! How cool is that?! Deadline: 11:59pm Friday, July 13th. Winner will be selected by random drawing. Remember: Earn one level up for sharing your avatar plus additional level ups for every new avatar creation website you share! This has been a week of Epic Wins. 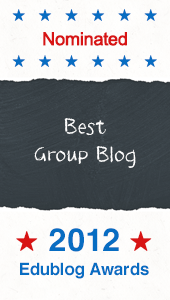 Last week we challenged you to locate and share awesome articles, videos and other resources related to gamification and game based learning. We gave you the option of posting your treasures on Twitter or via the #levelupbc Tumblr and offered a sweet, sweet reward to the person who shared the most. And boy did you guys deliver! In just one short week, 183 scholarly articles, blog posts, news features, educational videos and other game based gems were shared! This kind of crowdsourcing takes a group effort, but one #levelupbc member was definitely on fire this week! 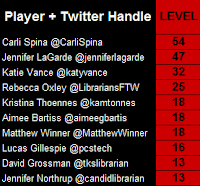 Congratulations to Carli Spina whose epic sharing not only rocketed her to the top of the #levelupbc Leader Board but also helped guarantee an epic win for the rest of us as we continue to explore game based learning and what it might mean to our practice as teachers, librarians and other education professionals. Way to go, Carli! Just one day after this challenge was posted, Matthew and I knew were onto something big and started scheming a way to curate all the great resources that were being shared. While you guys were busy researching and revealing, we were busy putting together a collection of the links that were being tweeted and tumbled. Our efforts resulted in a Level Up Book Club Livebinder - an epic collection of categorized resources for us to refer to now that the challenge is finished. We hope to continue to add to this resource as time goes on, but are thrilled with its current incarnation - which would not have been possible without all of YOU! Again, this has been a week of epic wins! Thanks to everyone who participated in this week's challenge. Stay tuned for info about next week's task. Here's a hint: It's gonna be fun! 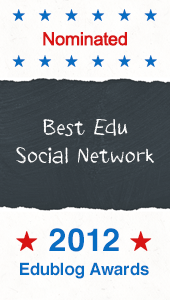 Directions: Find and share awesome articles, videos and other resources related to gamification and game based learning. Resources can be posted to either the #levelupbc tumblr or to Twitter using the #levelupbc hashtag. Easy, right!? Update: Super kudos to #levelupbc member Katy Vance who created a Diigo group for the bookmarks collected by this challenge and beyond! Feel free to post these resources to Katie's Diigo which we've linked to above! Woot! +1 Initiative to Katy for being a #levelupbc rock star! Reward: This week, the more resources you share, the more points you get! AND the person at the top of the leaderboard by the end of the week will not only have major bragging rights, but will also win a one off video thank you card from one of your #levelupbc hosts. Sweet! Deadline: 11:59pm Friday, July 6th. Good luck! PS: Even though this isn't the official challenge this week, we'd also like to invite you to share photos of you + our next read on our Tumblr. It's always fun seeing our members sporting some super summer reading material.